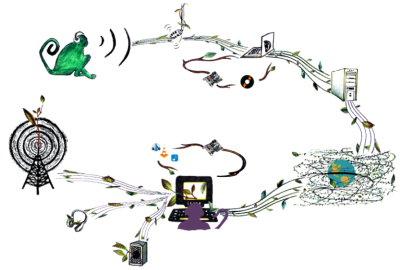 What is an Internet radio stream? An Internet radio stream (sometimes called a "webcast" or "webstream") sends audio content continuously over the internet. Listeners can tune in using their computer, smartphone, or other internet-connected media player like an iPod. Starting an Internet radio station is a great way to develop radio programming and try new things at a fraction of the cost of terrestrial radio. If you're on your way to starting a terestrial radio station, you can stream as a way to build an audience and train volunteers in the time leading up to your first broadcast. If you're already on the air as an FM or AM radio station, you can use internet streaming to reach listeners outside of your normal coverage area or to provide additional content that won't fit into your on-air schedule. A podcast is a format for distrubuting radio shows over the Internet. Technically, it is the combination of an audio file and a RSS feed. Unlike an Internet radio station, a podcast does not broadcast an audio stream continuously. Instead, each podcast episode can be downloaded as an individual audio file. And, using a podcast client like Miro or iTunes, you can subscribe to a podcast so that new episodes download automatically as they become available. The difference between Internet radio and podcasts can be hard to understand. One way to think about it is using a television anology. An Internet radio station is like a television channel: they both broadcast all day long and run a variety of different programs. A podcast is like a TV series: there are multiple episodes that are released at a regular interval, like once per week. Like using a VCR or DVR to record your favorite TV show each week, you use a podcast client like Miro or iTunes to download each new podcast episode. It is easy to publish your own podcast. Each podcast is made up of two parts: an audio file uploaded onto a Internet server and a message feed (called an RSS feed) that is sent around the web. There are serveral free ways to publish a podcast. Here are some links: podomatic.com, podbean.com, poderator.com, soudcloud.com, audioboo.com. Visit our page, Starting a Podcast, to learn more. What do you need for Internet streaming? There are several different ways to setup an Internet stream. The setup that will be best for you usually depends on your budget and the quality of your Internet connection. Use the Key to Internet Radio tool to find what streaming setup will work best for you. You will need the following things to start an Internet audio stream. Internet connection: In order to stream audio, you will need a stable broadband Internet connection. Computer with audio input: You will need a computer with an audio input jack. Most desktop computers have this audio input which is sometimes labeled as a microphone input. If the computer you are using does not have a functional audio input jack, you can purchase a USB sound card or audio interface that will serve the same purpose. Server/host: Like a website, an Internet audio stream needs to be hosted on a server. You can use a computer at your studio as your audio server or you can use one of several services that provide an off-site server. If you use an off-site server, you will need a computer at your studio to receive audio and upload it to the server. Streaming software: You will need to install audio streaming software on the server you are using whether you are using your computer as your audio server or you are sending the audio to an off-site server. Linux: Internet DJ Console, Darkice. Audio content: This is the most important part! other audio sources: CD player, turntable, computer, etc. 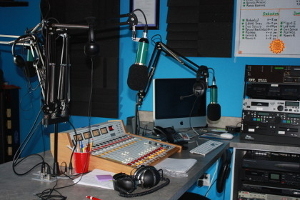 You can find more information about building a radio studio on our Studio Info page. and for downloads. SoundExchange requires internet broadcasters to submit quarterly reports of use. Many streaming applications are able to record artist and song information for content that is loaded into the software, however, if content is played through external hardware such as CD players, Ipods, labtops, etc, then programmers have to manually enter the information into a log. Flujos-vivos is a project intented to introduce people to streaming radio via open source software. The flujos.org website contains excellent Spanish language streaming resources. Take note! It's important to remember that despite the advantages of internet streaming, it also has some real disadvantages. One major disadvantage is that while streaming radio is generally cheaper to transmit than "on-air" radio, it's a lot more expensive to receive. Buying a computer and paying for internet service costs a lot more than buying an AM/FM radio. Also, one of the beautiful things about radio (especially low power radio) is that it is inherently local and is a great tool for building local communities. It's easy to lose your focus on local people and local issues when your stream is available to the entire world. For these reasons, we at Prometheus see internet streaming as a supplement to old-fashioned on-air radio, but not as a replacement for it.